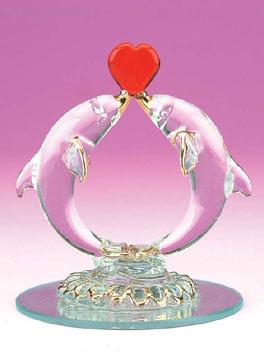 This hand-crafted Kissing Dolphins with Hearth Glass Figurine comes alive in stunning detail as a true work of art. Great for home or office decor, perfect for a wedding cake topper, or an ultimate gift for the dolphin lover. 3 inches H. Hand-Crafted Glass with 22k gold.